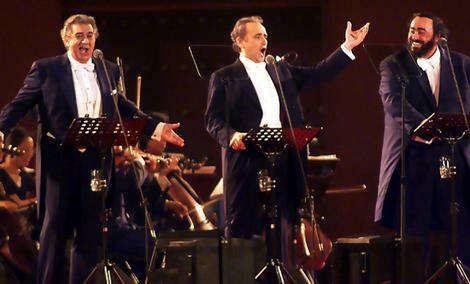 Everyone is familiar with the phenomenon known as the Three Tenors, where three of the most successful tenors of their generation (Luciano Pavarotti, José Carreras, Plácido Domingo) came together. Who are my favourite three? Who are your favourite three? Initially a celebration to mark Carreras’ recovery from leukaemia and to raise money for his charitable foundation, this stadium offering has been much criticised (and understandably so) musically, as a purely commercial success of a very limited musical diet. It decontextualised opera, presenting it as something it’s not. However, it did much to enhance awareness of the tenor voice, and there is a reason why I like the Three Tenors, much to my friends’ surprise, although not always the choice of repertoire (Please, you need to hear Nessun dorma in the context of Turandot, not just on its own). They knew their Verdi. They all had solid vocal technique, and their careers on the operatic stage all flourished long before this phenomenon. Being a tenor is a really interesting thing. It’s not an easy voice type, and there is a reason why it’s notoriously hard. In your vocal registers, there is a region called the passaggio, a passage between your head voice (It’s not falsetto, you dumbos) and chest voice. (A lot of these terms have been frequently misused, adding to the confusion. They can also be to do with the sensations, rather than what is actually physiologically happening, which can be misleading.) If you were humming or singing, you start to experience a tightening as you go into the passaggio, and it often results in the voice cracking. Lighter voices may negotiate the passaggio with more ease, but heavier voices find it harder. Classical singing (unlike pop singing, which just shouts through this with a high larynx, which tires the voice out easily) seeks to retain the resonance (keep ya larynx loow) through this area by increasing the appoggio and modifying the vowels (What happens is that you lose the resonance with the fundamental frequency, so you compensate by utilising higher formants). So many hours spent on unifying the registers, making it smooth, so that you can’t hear a difference as you go through the different areas of your voice. That’s far more impressive than those high notes. The tenor differs from all other voices, because we do so much more of our singing in this awkward passaggio area, and beyond than any other voices. For a lyric tenor, this is between D4 and G4. Leggiero would be slightly higher, and dramatic would be slightly lower. (Do I need to clarify the fach system too? There are different categories within each voice. You undertake a role suitable to your voice according to the colour. A Heldentenor wouldn’t take on light Rossini, and a leggiero wouldn’t take on Tristan.) The tenor voice is the furthest from the speaking, modal voice than any other voice, and it’s just pure hard work to figure out the intricacies of the instrument. You need to have an intimate knowledge of these technical issues, and the best of them (just like in tennis), make it sound so easy. Once you realise what they’re actually doing, it’s remarkable. For my eighteenth birthday, my friend Emma Simmons gave me a book by John Potter called Tenor: History of the Voice. I don’t know if she knew what the book was about, but it turned out to be very helpful, and assisted in developing my love for the historical tenors, those singers whose voices were preserved on old recordings. Stephen Robertson did say to me that it’s rather outdated, but I like it, as it served as a useful introduction. The tenor voice is exciting, thrilling, passionate, and I’m so glad I’m a tenor (It takes more persuasion to feel the same on a bad day). Who are my three tenors? I’ve thought long and hard about this. I’m sad not to be able to include others like Enrico Caruso (Lauri-Volpi, ShipaBeniamino Gigli, Mario Lanza, John McCormack, Alfred Piccaver, Nicolai Gedda, Richard Tauber, Georges Thill (Slezak, Melchior, Kollo, Jerusalem, King, Vickers, Heppner), di Stefano, Corelli, Bergonzi, and that’s not including any of the more recent singers, like Jonas Kaufmann. I did say, I’m a bit obsessed. I’ll talk about the others, maybe some other time. Who are your three tenors? Do you agree with my choices? Oh Fritz, you make me smile. Tamino became almost a signature role for him. I treasure his recording of Die schöne Müllerin with Hubert Giesen. He died in an accident when he was 35; at the time of his death, he was recording The Creation with Karajan – Werner Krenn later recorded the recitatives. Who knows, maybe he would have moved onto the heavier repertoire as he got older and his voice darkened. Relatively unknown outside Germany in his time, but the recordings have made him famous everywhere now. Especially his i-vowels, and the way he sings through the nasal continuants. The way the sound pours out of him, it’s just such a joyous expression of who he was, and is, now in my mind. Big fan. Swedish tenor Jussi is often thought to be the best tenor. Nigel Douglas describes his voice possessing the haunting beauty of the more melancholy and introspective North. Think Scandinavia, Sibelius. It’s such a good instrument, but how he uses it when he’s on form. His technique is flawless, watch how effortless the singing is, how efficiently he uses it. Gedda may have been better at languages, and the latter part of Jussi’s career was clouded by alcoholism, but it’s just such a magical voice. His La Boheme with Beecham and Victoria de los Angeles. Still the best one. (Ok, maybe Chailly with Alagna/Gheorgiu is better in terms of sound quality). You hear his sound, and it’s instantly recognisable. (Bizet’s Flower Song from Carmen). Another tenor whose voice is instantly recognisable as no one else’s, I first heard the Spanish Alfredo Kraus in a recording of Cosi fan tutte with Schwarzkopf, Ludwig, Berry, and Karl Böhm. He excelled in the French repertoire, notoriously hard for non-native speakers. Everyone remembers him for Massenet’s Werther, with the aria Pourquoi me réveiller? Absolutely solid technique, he was singing into his 70s. It’s not just the beauty of his natural instrument, it’s his refined musicianship, and effortless vocal production. Swathes of legato line. Yay for Kraus.